A feast of fall recipes, savings and tasty tips. The fall harvest. Local farmers. Family. Friends. Fireplaces. Squash. Pumpkin pie. Quirky traditions. Apple cider. Big piles of leaves. Sweater weather. Dark Chocolate Caramel Whipped Cream. There are so many reasons to be thankful this Thanksgiving, we can’t even begin. To get you started, we’ve put together a collection of our favourite fall recipes. And don’t miss the coupon at the bottom. Our small way of giving thanks to you. This Cookie Caramel Cheesecake satisfies a sweet tooth for one. And with only 5 ingredients, it’s a snap to put together. Feeling generous? 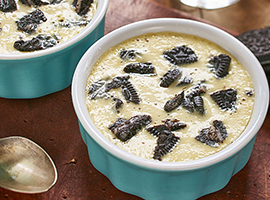 Double the recipe and share with someone special. It’s too good to keep to yourself. 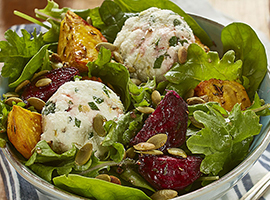 Colourful local beets and delicately herbed Ricotta top crisp greens in this extraordinary autumn salad. Serve it as a light supper, an elegant starter at a dinner party, or as a new addition to your Thanksgiving feast. 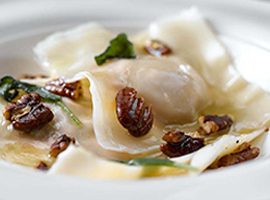 Homemade ravioli gets a shortcut with wonton wrappers. Stuffed with pumpkin, sage, and two types of cheese, this delightful dish has a rich and savoury fall flavour. 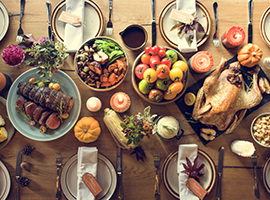 By making a few simple changes to your apps, sides and desserts, your guests can still enjoy a rich and varied Thanksgiving meal, without the guilt or extra padding afterwards. Our favourite fall colour? Dark chocolate. Our popular Real Dark Chocolate Caramel Whipped Cream has returned. 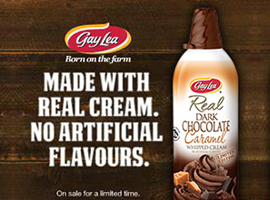 Made with real cocoa beans and natural caramel flavour, it’s our whipped cream with a dark and delicious twist. Fine cheddar for less cheddar. Perfect for your Thanksgiving cheese board. 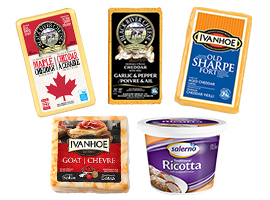 Save $1 on artisanal Black River, Ivanhoe, or Salerno cheeses.